The top seller of the high dollar automotive spectacle that is Barrett-Jackson Scottsdale was a beautiful blue 1948 Tucker Torpedo. Tucker #1043 was hammered sold at $2.65 million ($2.91 million with buyer's fees) during the high dollar afternoon/evening portion of the auction last Saturday. Acquiring one of the 47 surviving examples of the 51 Tucker's made has never been a cheap proposition because of the car's interesting back story and distinctive forward thinking design—not to mention how rare they are. Last Saturday's hammer price more than doubled the previous record Tucker sale price of $1,127,500. Although it's too early to fully understand the impact, this record sale will undoubtedly significantly drive up the value of the other 46 surviving cars. 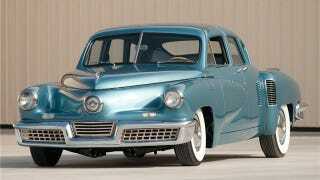 Something tells us there will be several Tuckers crossing the auction block in the coming months.